Do new grads want cash? Yes — all day long. But you and I both know what new grads will do with it. Instead of setting them up for failure by handing over a hot wad of Benjis that'll burn holes in their pockets, steer them toward success with these financially valuable, money-inspired gifts. I knew the basics of cooking and cleaning when I graduated college (I could scrub a toilet and do my own laundry, at least), but there were plenty of skills I lacked — like home improvements, vehicle maintenance, and, yes, money management. And while I had people around to help with many of those inconveniences, I was still kind of a disaster for the first few — OK, six — years on my own. If someone had gifted me a help-yourself class or two, however, not only would I have been better prepared to enter the "real world" more confidently, but I could have capitalized on those skills to earn side income (because that's the real thing I'm great at). That would have come in handy when I was eating pizza bagels for every meal. New grads won't have the kind of emergencies that older adults do, but even the smallest crisis can turn into a major financial burden for someone just starting out. Lend a helping hand by setting up an emergency fund in their name at your bank (not theirs) so they're unlikely to drain it for early-20s nonsense. If you've racked up loyalty points and want to save money on grad gifts, look into gifting these transferable rewards. "Loyalty points are a great money gift to give new grads instead of cash," says U.S. Travel Association spokesperson Laura Holmberg. "Loyalty points allow them to cash in for unique travel experiences at the time and destination of their choice — maybe for a post-grad getaway, or to put toward that first vacation once they're in the 'real world.'" 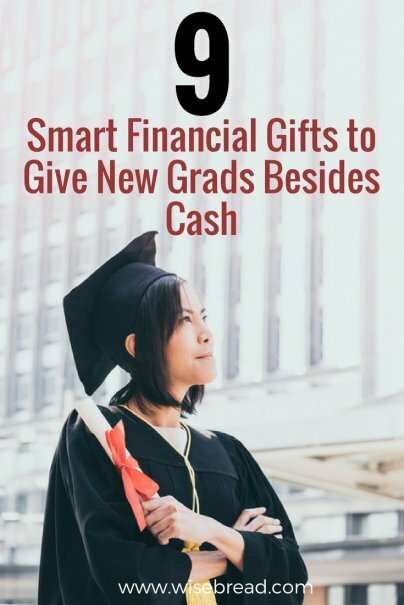 New grads might not want to crack open a book right away, but gifting self-help books that lie in waiting until they're ready will be worth every penny once they pick them up and implement the actionable advice. Gift cards are a safe and popular gift to give, but when buying for new grads, think practical instead of frivolous. They might not appreciate $50 to a supermarket in the moment, but there will come a time they'll recognize that gift card as perhaps the most thoughtful and useful of the bunch. Other sensible gift card ideas include cards for gas, a new interview suit, work supplies, and home essentials. Many college grads start life with student debt looming over their heads, and you can help alleviate that burden somewhat by providing a few initial payments as a gift. Broke college graduates don't think much about making investments right out of school when they're peering down a dark tunnel of 10 to 20 years of student loan payments. As such, this is a great opportunity for you to take the lead where investing is concerned. "You can do this by giving them money to invest and starting them out with a well-known investing app like Acorns," Pehrson says. "Again, going through it with them step-by-step can ensure that they actually invest that money." Take some time to explain how investing works, too. It's scary for a lot of people, but knowing what to do, why, and when will help new grads wrap their head around why it's important to keep this option open as a lifelong financial tactic. Retirement is the farthest thing from a new grad's mind, but you and I both know the earlier you start saving for that glorious day, the better. And in terms of the ROI, a Roth IRA is near the top of the list of best grad gifts.